This week has been the week of Fedora Flock in beautiful Krakow, Poland. Due to other travels, I was unable to attend which meant that I have been focusing this week on getting some outstanding tasks done that had been delayed on my part. One of those tasks was getting Fedora 22 ready for being permanently archived. A Fedora release has many stages in its life. A short mature life as an imago while the next release is in its pupil stage. Then like all things, the release shuffles off this mortal coil and gets moved to the afterlife in the Fedora Archives. The Fedora Archives are a hidden resource for people needing to find some older package or to try and track a history of packages. I use it quite extensively for building packages for EPEL ( a post for later ) or to try and find the 'last' workable version of some software as various things in Fedora evolved past the Enterprise Linux release. Before version N+2 goes into beta, hardlink copy with cp -l the version N from /pub/fedora/linux/releases/N into /pub/archive/fedora/linux/N. This allows for any mirrors who do slow updates of the archive tree to start getting the data moved over in their trees. A week later we log into the mirrormanager tool and change the point where F-N updates are pointing to the archive version. This means that systems still looking for updates will not get 404's but will be directed to a mirror of the archives. We then remove the data from the main Fedora disk space. We can do this because /pub/fedora, /pub/archive and /pub/epel are all on one disk which allows for us to hardlink them together and if a mirror is doing a rsync -avSHP of the trees they should not have to transfer as much data because of the hardlinks. In any case, I have started the archive of Fedora 22 and next Friday will complete the archival by moving the pointers in mirrormanager. Thank you Fedora 22 for your service. There seem to be fixes that will work for people outside of areas that are covered under current software patents (which for all I know is nowhere because of some super secret trade agreement). Look at ask.fedoraproject.org for steps to use. Look at installing and enabling RPM fusion on your system. Follow the steps in 1. Or you can look at something like fedy which I am going to point to the source code for. I don't recommend using the method listed on their website because using a blind su "curl" is a recipe for disaster. Instead I would recommend looking at the code, seeing if you would want to run that on your system and then doing it by hand. I work for Red Hat as a system administrator for the Fedora Project where I get to do a lot of neat and interesting things daily. One of the tasks I have is gathering various statistics for the Fedora Project Leader's state of the hat speeches like the one he has just given at Flock. This means I also get to help answer regular questions on mailing lists and irc channels like "How many users does Fedora have? ", "How many downloads of Fedora are there? ", "How does this compare to ?" The question "How does this compare to ?" is the easiest to answer: "Nothing I give you can be compared to what any other distribution probably says." This doesn't mean I or they are lying... it just means the terms being used aren't well defined and we are probably using slightly different ones. What is a user? Someone who created a Fedora account, did something and never logged in again? Someone who created a Fedora account and logs into FAS daily? weekly? monthly? yearly? Maybe that person who never logs in just answers things on IRC or bugzilla or mailing lists? Maybe the person who logs in daily is just a script that does that because a developer decided to test a cron script and then forgot about it. Some people mirror everything. They may not install any of it.. but just in case they ever need it.. they have it. Some people try to be helpful in promoting their OS by downloading the OS over and over again so that any count of downloads will be larger than the next guys. 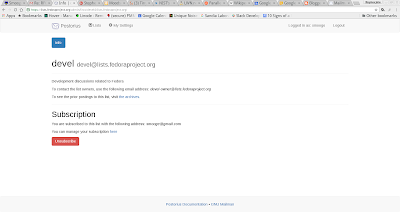 There are multiple IP addresses which download Fedora isos hourly. No one needs 24 copies of Fedora 8 every day... especially when they had just downloaded 24 copies of Fedora Zod. Some "web companies" do the same and then send us mailers about how we can see how they have increased our downloads and if we used them we could see even further growth. A lot of people use specialized download tools which try to torrent downloads via http. What they do is ask 20-100 times for a mirror and then use each one to download a bit of the file as a speed booster of some sort. This shows up as even more downloads. Then there are the people who are stuck on NAT over NAT or satellite links. They may show up as a dozen or so IP addresses in their attempt to grab a single IP address. On the other side there are multiple people behind a single NAT so that the 200 downloads from IBM are probably not the same system.. but maybe they are? There are ways to get clearer results via various 'fingerprinting' techniques but I don't think that they really can help when you have companies whose basic job is to bump up numbers so you can lie about how good your product is doing on the web. [I am going to avoid commenting on the morality of deep fingerprinting because I am in a rather cranky mood today.] Depending on how one looks at the data, you can keep discounting stuff further and further down until your only answer is that you know that you had more than 1 download and less than whatever your max amount of non spider hits were. So what does that leave us with so many "unknown unknowns" and too few "known knowns"? What we have been using has been not looking at downloads at all and instead focus on actual users who have installed the OS and are using yum or dnf to update their systems. This can give us a rough lower bound number of 'active' systems. Going through the mirror logs we create a large amount of tuples of (date, ip address, hardware arch, fedora release). We then unique this list to deal with the various users who have cron set up to do a yum update every 10 minutes. It has a bad effect of making the thousands of systems behind the Red Hat NAT be counted as 1 system, but we hope that is made up for by the person doing a yum update over their Verizon phone and showing up as 20 ips as they get ip shifted every now and then. Now again these are 'reasonable' minimum numbers. The N thousands of ARM IOT systems with Fedora on them do not do yum updates so aren't counted. The systems which are hard configured to use a local mirror aren't counted. And so on and so on. The above graph is a hack job I created using awk and gnuplot with a 7 day moving average calculated via python pandas. I expect that it could be made prettier or cleaner through various ways. 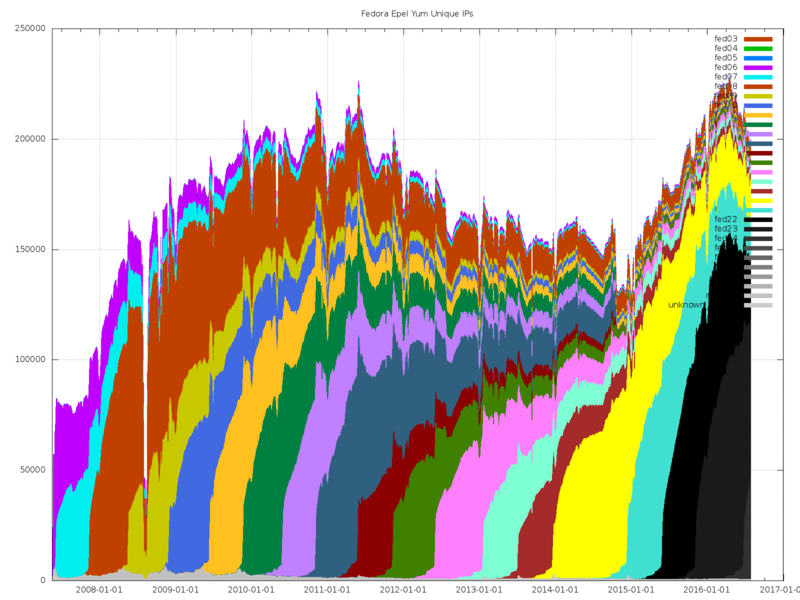 The drop off in late 2008 was due to the webservers being mostly off during the security incident of that time. The hockey stick drop off in late 2014 is due to Fedora dropping support for RC4 encryption and various systems hard coded to use it not being able to check in any more. All of these systems were way past End of Life for each release so they were not getting any updates. Most releases have a growth pattern of continually growing until the day the next release comes out. That pattern changes for Fedora 8, 14 and 22 which seem to have continued to grow even after they were end of lifed (or close to it). These seem to be due to some VPS, cloud or similar provider continually basing images off of these releases. I think somewhere in this post I lost my original focus. Sorry about that.. I looked at the picture and got all oooh I need to talk about that. 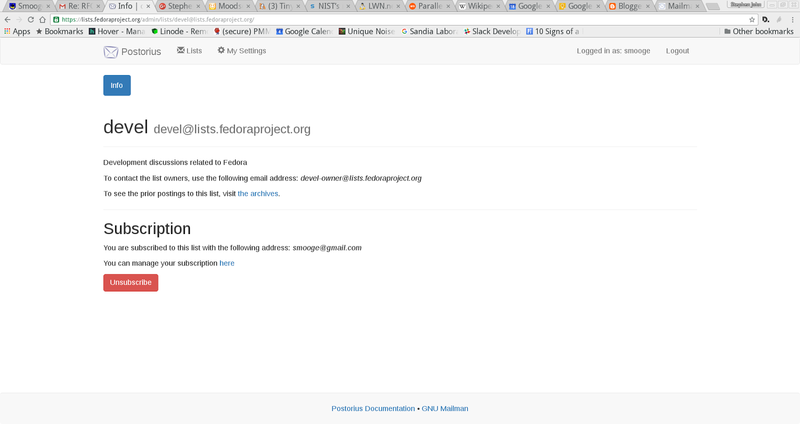 Fedora PSA: How to know you are seeing a SPAM web page. or some similar text. My first guess was that these are either used as landing text pages for some sort of malware to pop up some sub-section of the webpage as a problem alert. You have a problem with your . However that made less and less sense in that the pages did not seem to have any encoding for the malware to say 'this is the string to use today'. It also didn't make sense in that it was clear that this was being inserted many times by a cut and paste versus program insertion (someone would double paste the text into a web page but with the text intermingled). In any case, back to the subject title. If you are seeing a large page of text with various small variations on 'search terms' to get you technical support for product.. and a phone number DO NOT CALL IT. Especially if the page you are looking at is NOT for the product you are looking for. If you are ending on some other website, it is most likely some sort of scam. In a recent #fedora-admin IRC conversation, it was asked if Fedora Infrastructure ever makes accounts inactive. We have done this a couple of times in the past, usually after a security breach where password hashes may have been seen. While happily we have not had a security event happen in a while.. we did have a large amount of spam accounts created which have taken up a bunch of names that people may want to use (if you have wanted vipin1 -> vipin357, nagar1 -> nagar240, or many others, you are currently out of luck). We also have many users who created accounts, and either never logged into FAS again or haven't for over a year or more. The Norwegian Blue Parrot Problem. For the second problem, we are looking at making changes in the new FAS system so that we can give users an 'EPOCH' where 0:thegreatandmightyoz is different from 1:thegreatandmightyoz in various systems trying to figure out what is linked to whom. For the first problem, we will work out a system of saying that a user who has not logged in for N days (where N is greater than say 270 days ) will be set for inactive. We would then advertise quite a bit before doing it and then get ready for a long list of arguments and complaints :).